Providing gifts to guests at a wedding has been tradition for centuries and has varied across cultures and populations. Originally related to European wealth and extravagance, the gifts were fashioned of small boxes made of precious metals and gemstones. Other cultures believed the bridegroom to be a coming of good luck, and the gifts were thought to be lucky as they were presented by the couple. 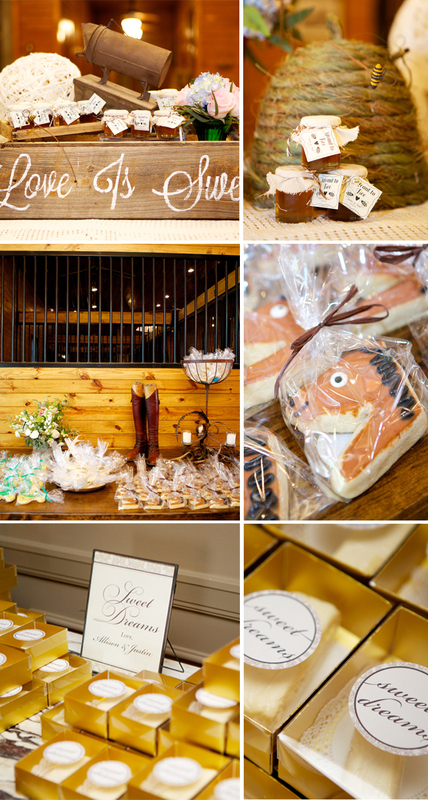 Today, the wedding favors often extend on the theme of the weddings and vary greatly in what they might be as they are considered a portrayal of the couple's personality. Koozies are common due to their useful nature both at the wedding and afterwards. Take-home sweets and recipes in jars are also gaining in popularity. Personally, I have to say, those succulents are a favorite!